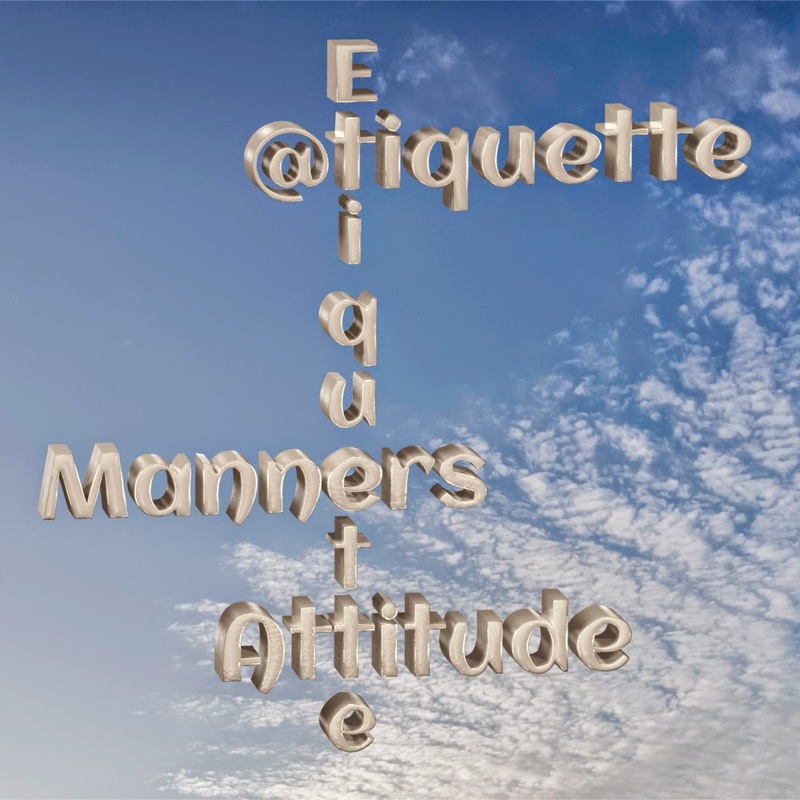 @tiquette: the void created by the sheer absence of etiquette which is filled with a lousy attitude. Many, many, many, years ago, long before anyone hip was born, two decades have since passed in fact, we still wrote letters. I know, it seems awfully droll now, and time consuming in retrospect, but we persevered through the sheer agony. We also tried to be engaging when we communicated via the written word. You know, LOL! We kinda like used more than a few words in one sentence, and punctuation was not sorta like optional. A few times a year, we wrote lengthy letters to all our distant friends and relatives, and took many precautions to avoid boring the recipients. We had this terribly archaic notion of conveying basic mutual respect for one another. Now, everyone shudders at the complete lunacy of it all, of course. It was quite ghastly, and with all those long sentences too. Why — some of them could really stretch on, sometimes even as long as four or five words at a stretch, OMG! With the wonderful, everyday implementation of the Internet, centuries of letter writing was lost, suddenly … over a decade. I used to say that people “switched on their modems and immediately switched off their manners”. Now people have sunk even lower, and coupled with an ever-decreasing attention span, I now call it, the ‘@tiquette’. The bygone era of simple etiquette has been replaced with a mere ‘texting’ @ttitude. While I wholeheartedly approve of acronyms and severe abbreviation when it comes to sending an SMS — short message service, for those that have forgotten — I don’t believe it should apply to so liberally to em@il. Mail is correspondence. When you place an ‘e’ in front of it, it becomes electronic correspondence, not short message service! Just as it is bad form to send an unaddressed letter through the post, similarly it is appalling to hit ‘send’ without bothering to state who you are addressing, or even, which fool has sent it. The lazy @tiquette that states that the recipient will ‘know’, is just infuriating to me. Annoyingly enough, these are often the very same people that protest that they are ‘misunderstood’ and, unfittingly, demand respect! With this post, I may have suddenly aged a hundred years in the eyes of my young readers, but I am too old to care. I do not have an @ttitude about it, but etiquette still demands that you finish your sentences, and for heaven sake … sign your bloody name/nick/handle/nom de plume below every electronic mail you send! For those of you who believe that you do not need to reply to an email(s) that you have requested, you are just plain rude. If you ask someone to take time to send you their CV, the very least you can do, is send them a ‘copy and paste’ thank you as a reply. If you cannot do this bare minimum, I probably have no desire to work for you either. With so much drivel that has oozed its way into the Oxford dictionary, my new word is surely next … hashtag #Oxford. The above post was directed at ‘professionals’ in business. Now Let me start berating the private individuals, kids, and peeps …. #humour. Facebook, Social Media or a Social Monster?